"We'll sing what we want / We'll sing what we want / We're Tottenham Hotspur / We'll sing what we want"
Gentile or Jewish, a supporter’s right to use the word ‘Yid’ in the context of supporting Tottenham Hotspur is a complex issue. Initial mutterings from then Arsenal chairman David Dein have evolved via the route of David Baddiel, Peter Herbet, David Cameron and now to criminal proceedings being brought against Spurs fans for singing ‘Yid army’. There is already an abundance of great material written around the Y-word issue, and the point of this article isn’t so much to go over the already ploughed soil. My particular umbrage is with the chant at the top of this article. I’ve never particularly been a fan of the defence ‘well if you don’t like it then eff off’. There’s plenty of times I’d love to be able to say that in an argument, and often do, but willingly submitting yourself to ignorance is never quite as satisfying as arguing your point in a proper fashion. Whether you agree with it or not, there is a discussion to be had against the use of the Y-word. David Baddiel, whatever his motivation for bringing this to light, is a Jewish man who is offended by the use of a derogatory word used to describe persons of his faith/race (again, a complex issue). This doesn’t particularly make him right, as the many Jews that line the terraces of White Hart Lane who happily sing this song alongside fellow Spurs fans, will attest to. However to deny Baddiel his right to debate, to voice his own disapproval, is wrong. Can we expect the world to hear our voice if our response to adversity is ‘la la la we don’t care, we’re not listening’? 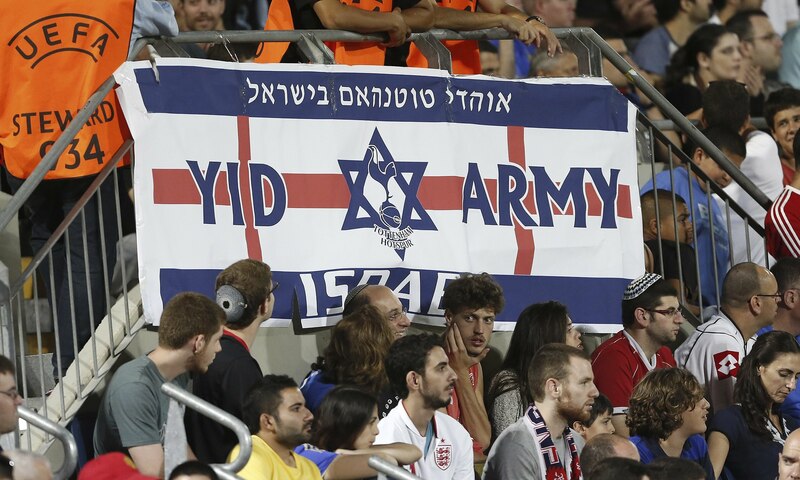 Many say we sing ‘Yid army’ to combat anti-Semitism. Many will simply sing it because it’s just what we’re called. It’s our identity, woven into the fabric of the club. As Jermain Defoe waved goodbye to the Park Lane, to be met with a chorus of ‘Jermain Defoe, he is a Yiddo’, I’m not sure there was any political sentiment to be had. Worrying stuff. By all means, we should sing what we want, but we just get on with it and sing it. After the shaming of their captain for racially abusing Anton Ferdinand, certain sections of the Chelsea support could be heard bellowing “He’ll say what he wants, He’ll say what he wants, John Terry, He’ll say what he wants”. It became an admission of guilt. It says ‘we don’t care if you think that we’re scum’. However in my opinion, we should care what people think. We are not scum, and we shouldn’t give anyone the opportunity to think any different. With the club seemingly having given up on its supporters, we are in a seriously precarious position. With every passing game, there are more reports of police warnings being handed out, and I dare say that number will continue to grow. Instead, it is our duty to continue to work with the Supporter’s Trust. To continue to highlight to organisations such as the FSF and Kick It Out, that we’re not Neanderthals. That the all-important key to this issue, ‘context’ is not lost. There is no context to saying ‘we’ll sing what we want’, it’s just a big middle finger to the world. Including those who are fighting hard to preserve the right to use the word in appropriate fashion.